Metro Vac N Blo Jr. 500 Watt Hi Performance Hand Vac/Blower is the featherweight version of the full sized Metro Vac N Blo. Featuring both a high performance, hand-held vacuum and blower in one, the Metro Vac N Blo Jr. 500 Watt is now more portable than ever! 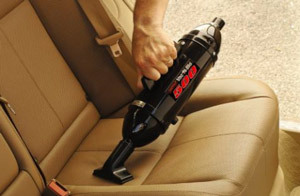 Youï¿½ll be able to vacuum all interior carpets and upholstery and blow away dust in your carï¿½s crevices ï¿½ all for under 3 pounds! The full-sized Metro Vac N Blo has been a detailerï¿½s favorite for years. It gives the user the ability to both vacuum and blow air, making it a very useful tool. The Metro Vac N Blo Jr. features the same time and money saving abilities, just in a smaller package! The Metro Vac N Blo Jr. 500 Watt is made of a sturdy steel construction with a black powder coated finish and features a 12 volt state of the art motor that generates massive power for such a small unit. Metro Vac N Blo Jr. has 60 inches of water lift and a sealed suction measurement of 24ï¿½ water lift (please note, this is a scientific method of measuring vacuum cleaner suction ï¿½ this vacuum is designed for dry pick-up only). Both professional detailer and detailing enthusiasts alike will enjoy the easy portability and massive power of the Metro Vac N Blo Jr. 500 Watt Volt Hi Performance Hand Vac/Blower!